In this article, Glaston discusses the benefits of our nitrogen generator hire service. We’ll preview the advantages our service provides and highlight why nitrogen generation is a smart move for your business. We’ll also cover related topics, such as the importance of reliable nitrogen generator maintenance. However, before we begin, it is important to understand how a nitrogen generator works. How does a nitrogen generator work? Let’s begin by considering the working principle of nitrogen generation. Nitrogen generation is essentially a more modern means of separating air, a process which has been done cryogenically for over a hundred years. These generators don’t create nitrogen, rather they use nitrogen already present in the air and concentrate via the removal of extra molecules. Due to the versatility of nitrogen generators, they are becoming increasingly popular in a number of industries including plastic moulding, chemical, food and beverages and packaging to name a few. There are two main nitrogen generators: Membrane Nitrogen Generators and Pressure Swing Adsorption Nitrogen Generators. Deciding which one to use is dependent on three main factors; purity, flow rate and cost-advantage over vendor supplied liquid. 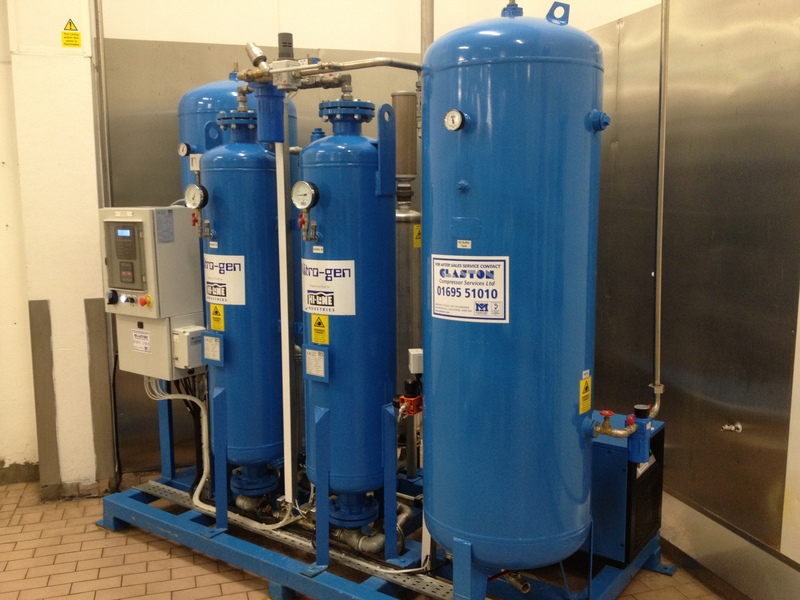 Now that you understand how a nitrogen generator works, we can take a look at the benefits of nitrogen generators. The key benefit of having a nitrogen generator on site is cost. As generators replace conventional cylinders, thus allowing companies to generate their own nitrogen on-site, businesses can potentially save up to 40% on overall costs when taking advantage of a nitrogen generation service. Here at Glaston, our engineers are highly qualified and have extensive experience in the design and installation of nitrogen generators. Before proceeding with any nitrogen generation service, our team can happily arrange an initial consultation to help determine the recommended solution for any on-site requirements. By offering advice that’s both practical and professional, this will help ensure you are as confident as possible in the suitability of our nitrogen generation service before we commence work. While nitrogen generators offer businesses a cost-effective solution on-site, it is important to invest in reliable nitrogen generator maintenance to ensure your system is properly maintained. As part of our nitrogen generation services, we offer all clients the option to invest in reliable nitrogen generator maintenance. Glaston can provide an effective and regular maintenance schedule which ensures your generator produces high-quality nitrogen and removes any concerns of contamination. At Glaston, we can provide clients with a nitrogen generation hire service. Whether you are looking to use a nitrogen generator system on a short-term basis or something more permanent, we have a range of total solution packages available to suit different industries. We understand that each client has specific requirements and Glaston prides itself on tailoring our nitrogen generation services to the needs of each individual client, by offering bespoke packages to match your company’s needs and budgets. By identifying energy saving opportunities for nitrogen systems, Glaston can guarantee outstanding performance and maintain cost-efficiency simultaneously. For more information about Glaston or our nitrogen generation service, contact the team on 01695 51010 or email info@glaston.com.